Reprint. Published in Scotland. This translation originally published: London: Ernest Benn, 1980. 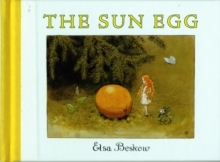 This is a mini gift edition of Elsa Beskow's classic story. A mysterious orange egg has fallen into the woods. "It's a sun egg!" declares the elf who finds it nestled on the forest floor. Soon she and her friends find out what it really is, but not before the little elf has one of the best adventures she has ever had.